This charming period townhouse, spread over three floors, is facing the Ocean and overlooking the well known 'Plage de la Côte des Basques' surfing beach. Located in a quiet street, the house is ideally placed to walk along the beautiful bay down to the beaches and to Biarritz many attractions. Unforgettable sunsets on the Ocean from the two terraces. A small courtyard offers a nice spot for eating or having a drink outside. A pool table complete a large offer of entertainments. Exceptionnal covered daily fresh food market at 5mn walk. Ideal for families with teenagers. A 3 hours maidservice per week is included as well as a safe parking place at a short walking distance. Spread over three floors, the house is a charming blend of traditional Basque features and a contemporary interior design. The spacious first floor is open plan with a dining room, fully equipped stylish kitchen and a billard room . There is also a small living room and a shower room with WC. A wooden staircase leads to the second floor with a large living room which benefits from a double balcony with sea views and plenty of space for sitting out. The master bedroom has a large en-suite bathroom with WC and a series of wardrobes. On the third foor, there are three more double size bedrooms, two of which have views over the ocean. One of the bedroom has an en-suite shower room. There is also a separate bathroom and WC. A small courtyard in front of the house can be used for drinks and lunch or diner. There are four bathrooms : two full bathrooms with bath and toilets, two bathrooms with showers, including one with toilets. There is one independent toilet. Subscription to a safe city parking at a short walking distance. A 3 hours maid service per week is included. Parking place available. Good restaurants all around. Daily fresh food covered market at 200m. Spa at 3 mn walk from the house. Motobikes and scooters for renting close by. Our stay in Biarritz was very pleasant. The weather was perfect, but even with a bad weather; the pleasure of staying in this house would have swept the rain or cloud away. The location of the house is perfect since it combines the proximity of the sea, shops and market without any traffic noise. The interior of the house is also very nice: the spacious rooms are well decorated and the English refinement is very present. Everything is convenient, from the comfort of the beds to the well-equipped kitchen. Should you wish to isolate yourself, 3 beautiful wooden terraces with a sea view, independent of each other, are waiting for you. Also with a sea view, and from inside the house, a romantic space for two seems to be made for reading and confidences. An American Pool (billiard) is also available at the ground floor. All this pleasure can be shared over 3 floors connected by a beautiful wooden staircase. 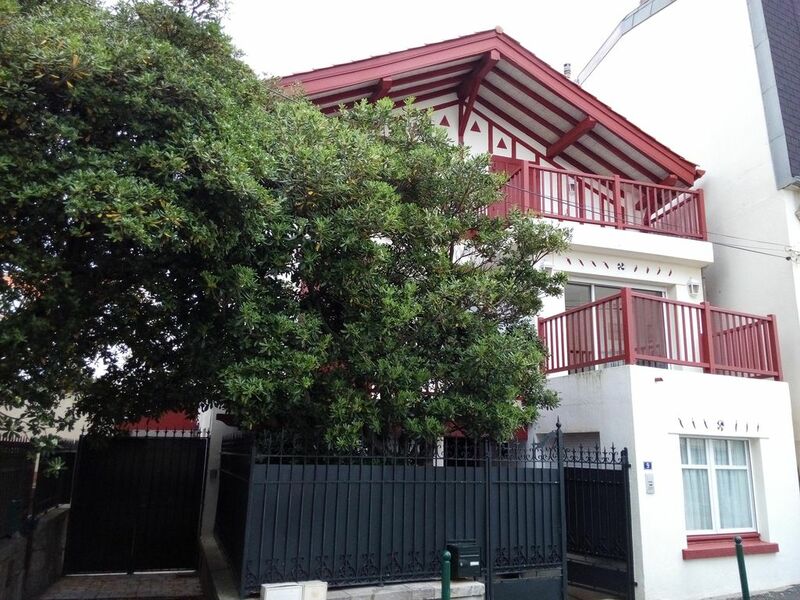 We had another fantastic fortnight at this traditional house in Biarritz ( our third visit). The accomodation is flexible and comfortable, exactly as shown, with large rooms and a well equipped kitchen. It is five minutes' walk down an attractive cliff path to the best surfing beach in the area, and our teenagers loved being able to walk to bars and night clubs in the evenings. The local food market is exceptional, and the location peaceful but still very close to all the lovely amenities of Biarritz. The most famous resort of the Atlantic coast, Biarritz, is very easily accessible by train and by plane. Golf: Within less than 20kms from the house, you can enjoy 11 different golf courses : Biarritz le Phare, Ilbarritz, Arcangues, Chantaco, La Nivelle, Chiberta, Bassussary, Hossegor, Seignosse and Moliets. Two of them can be reached by citybus. There is a golfpass with 5 of them : Biarritz le Phare, Arcangues, Moliets, Bassussary and Seignosse.